E540: Fight Fat With Fat PLUS Vegan Fat Upgrades. One of the many things I’ve changed my mind on regarding getting lean is the importance of good fats in your daily eating routine. I wasted years avoiding fat. I had a skinny-fat body. Yes, I could fit into small sizes but I looked weak, soft and certainly NOT fit. Even worse I felt weak. I was always hungry and because of that I was very often moody. I thought about food all the time and although food is pretty fun, I really don’t want to be thinking about my next meal all the time! I now believe fake will make you fat, not fat! Beyond the obvious – DELICIOUSNESS! – let’s run through some of fats benefits first and then later in the show I’ll share some of my fav Vegan Fat Upgrades. Fat Benefit One: Fat is satisfying. You know that light weight salad that might be huge yet really does nothing to satisfy you? That meal is always going to come back to bite you! Your body is clever. When you under eat in one meal it’ll be nagging at you for make up calories… and make up calories are often not quality calories. They can be those snackie, more’ish, craving causing little trickster calories that really add up. => Add nuts, seeds and avocado to your salads. Hemp seeds provide you with more protein per gram than beef. Pumpkin seeds have a decent hit of iron as do cashews. Almonds and chia seeds amp up the calcium. Avo? No need to sell avo right? => Find a good fat dip / sauce you love. My go 2’s are pecan-kale pesto and hummus (protein and fat pimped with tahini and hemp seeds). However your options are limitless. I recommend the minimalistbaker.com for some supreme dressing deliciousness including a 3 ingredient tahini dressing with just 1/3 cup tahini, 1 medium lemon juiced and 1-2 tablespoons of maple syrup. => Invest in quality oil. I’m a fan of avocado or macadamia oil on salad. An organic coconut oil on kale and brussel crisps took a moment to acquire a taste for however now I love it! Though the guideline here (as my design school lecturer used to say) “Less is more”. Fat Benefit Two: Fat slows down the rate at which the carbs you consume are broken down and released into the bloodstream. This lets you avoid the meal that sends your blood sugar (and focus and energy) levels soaring and then plummeting. It provides you with stable, reliable energy. At the same time it allows you to avoid over consuming ALL of the carbs! => Steer clear of just carbs on their own. So this is a green light to add a delicious sun-dried tomato cashew cheese to your #plantstrong pizza. Or coconut yoghurt to your kale-slaw and felafel salad. => Follow a light weight meal with a high value dessert. This might be a peanut nice-cream made with frozen banana blended with nuts. Or perhaps my Go 2 almond chia pudding made with 1/2 cup almond milk a tablespoon of chia seeds and a scoop of your fav vegan protein powder. => Avoid over hungry with a high value snack. Like a bliss ball. The basic structure for this is one part nuts blended with one part dates however the options are again limitless. Try adding raw cacao or vegan choc chips. A pinch of salt or cinnamon. Roll in coconut flakes or crushed pistachios. Fat Benefit Three: On an emotional level, Fat is fun. This is an underestimated component of getting and staying lean. I genuinely believe you need to love what you eat as often as possible to avoid the “I deserve!” effect. However as with most things fun, there can be too much of s good thing. => Embrace one ingredient unprocessed fats. So that’s the nuts, the seeds, the avo… as opposed to the vegan donuts, the vegan mayo, the vegan store bought cheese. => Embrace a running tally. The running tally accounts for too much of a good thing. 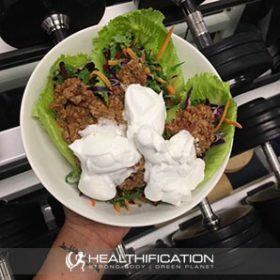 It simply means you have general awareness of the good fat you consume in a day and when you go a little over in one meal you adjust accordingly to go a little under in the next meal. Make your own nut based cheese. My Go2 is a sun-dried tomato cashew however to get more creative I recommend Julie Piatts book: This Cheese Is Nuts. Experiment with 1/2’ing the amount of (empty calorie)oil in a recipe andreplacing it with higher micronutrient nuts or seeds. Experiment with 1/2’ing the amount of oil you cook with and replacing it with veggie stock / water plus(Woohoo) this means you again get to add those higher micronutrient nuts or seeds. Swap margarine / vegan butter to avocado. Swap bought crisps to home made (my favs are kale and brussel however you can also try sweet potato, carrot, beetroot, zucchini and even collard). Swap biscuits and bars to nuts and seeds. Try almond milk and organic cacao (plus I add a sachet of Natvia) as a guilt free before bed hot chocolate. As a bonus benefit cacao has magnesium to aid your sleep. Bonus Vegan Fat Upgrade #11! Make over the Sunday roast with a nut roast. In full disclosure I’m yet to do this however it’s high on my list. The standard family roast is chocka full of saturated fat not to mention the slaughtered body of a baby animal. A meat chicken is slaughtered at 6 weeks. => It’s natural life expectancy is 8 years. A lamb is slaughtered at 6-8 months. => It’s natural life expectancy is 12 years. A pig is slaughtered at 6 months. A meat cow is slaughtered at 18 months. => It’s natural life expectancy is 20-25 years. The Nut Roast recipe I’m intending to WOW my family with this Christmas is curtesy of The Vegan Goodness cookbook by Jessica Prescott. To get actionable today do you think you could have more fun with fat? => Embrace one ingredient unprocessed fats. => Embrace a running tally. => Avoid borrowing from tomorrow. That’s it for today in Healthification. Huge thanks to YOU for sharing this week with me. The Healthification podcast is proudly bought to you by my FREE ‘3 Day Easy Vegan Plan‘. It took me 25 years to transition from a meat eater to a happy, healthy Vegan! You can do it in just 3 days with my simplified ‘easy vegan’ plan! Get the fit, strong, and healthy plant based body you deserve… while avoiding ALL the mistakes I made along the way!